There are few accessories that are more personal than jewelry, especially rings. A ring has to fit the style and personality of the wearer, and finding the perfect one can seem like an impossible feat. Fortunately, whether you’re a bride-to-be shopping for yourself or looking for your fiancée or wife, BHLDN is sure to have the ring of your dreams. After all, a ring is a piece you’ll wear for the rest of your life, so choose one you know you’ll love forever. Check out this list for just a few gorgeous options! This beautiful ring is ideal for the woman who wants something traditional with a modern flair. 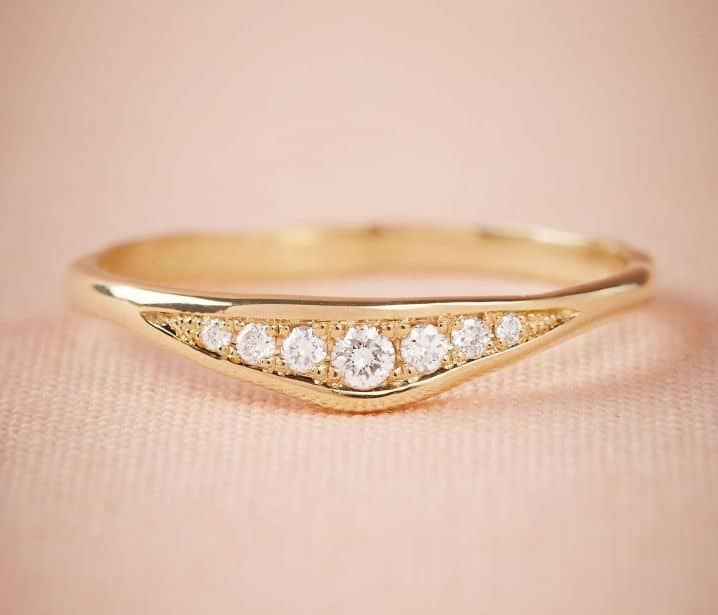 Handmade in the USA, the Flannery Ring is crafted from 18k yellow gold and features delicate diamond trios in almond-shaped inlays for an antique look. The slim band is stackable, making this piece perfect to wear as a wedding band or anniversary band with an engagement ring. Check it out here! It’s hard to imagine a more perfect ring than the Oleska Crown Ring! 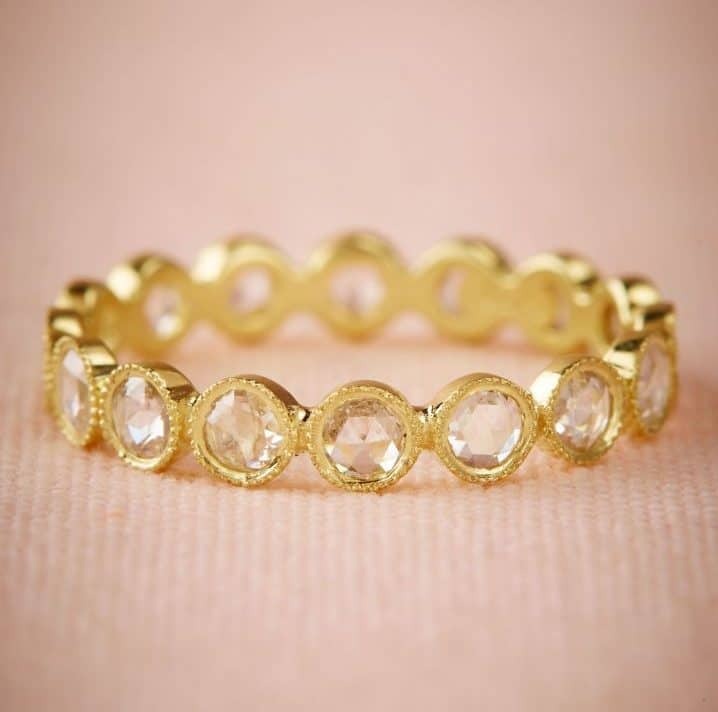 Handmade in the USA, this piece was created by Katie Diamond in 14k gold. 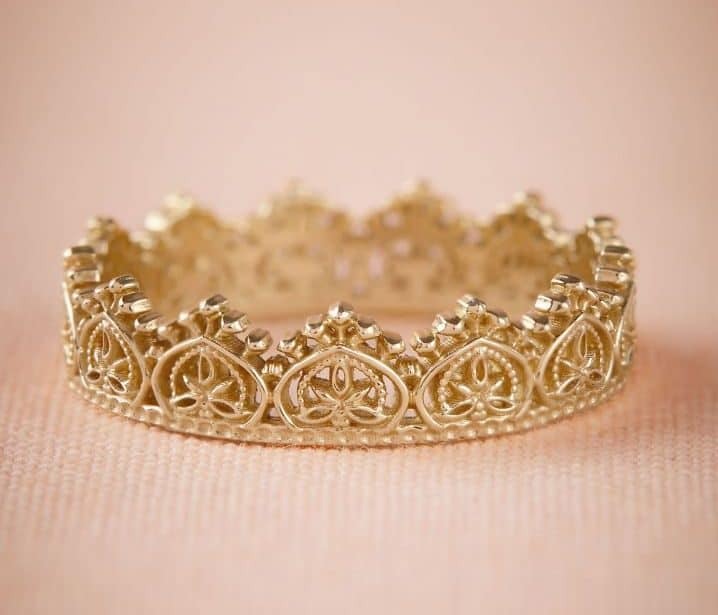 Inspired by the look of intricate lace, this delicate ring is sure to turn heads and make you feel like a queen! It’s effortlessly elegant, beautiful without being overly flashy. This piece is for the bride who wants something different for her engagement ring or wedding band, or a birthday present the woman in your life is sure to adore! Check it out here! The Bard himself would’ve loved this ring! 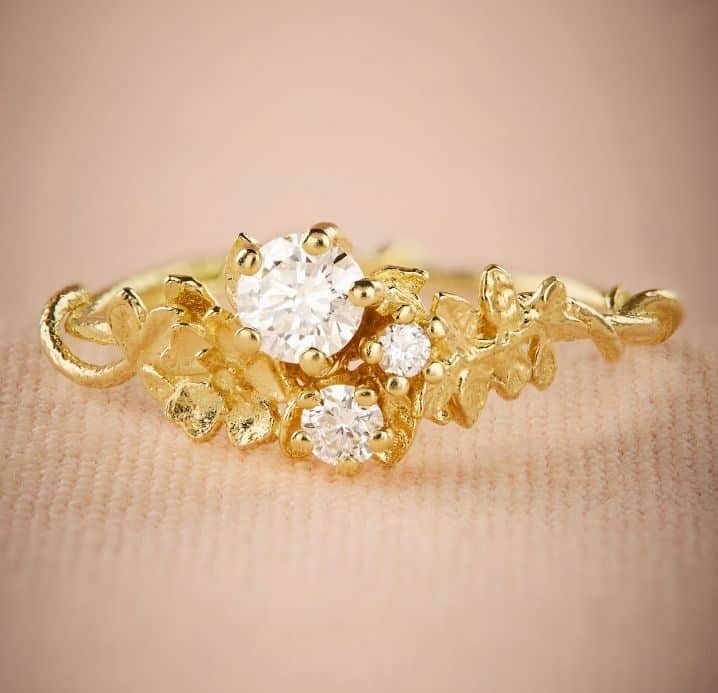 Handmade in Great Britain and crafted in 18k yellow gold, the design features intricate vines and roses twining around 3 diamonds in varied sizes. Propose with this ring, and any bride would say yes! This is an engagement ring everyone will love and fawn over! Check it out here! Seriously, the diamonds in this ring twinkle like the stars in the sky! Handmade in the USA, the Asterra Ring was chosen for its simple but beautiful design. 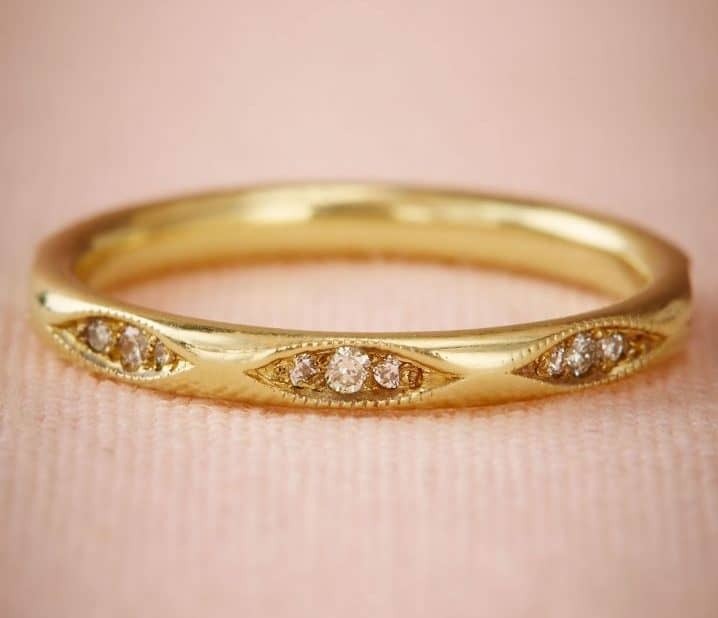 Crafted in 14k yellow gold and featuring diamonds of varying sizes, this ring is ideal to wear as a lovely wedding band, anniversary band, or as an engagement ring for the no-nonsense bride who doesn’t prefer a raised diamond setting. Check it out here! The aptly-named Raja ring is a stunning piece! These glittering diamonds in a chain of 18k gold create a unique and eye-catching finish. Handmade in the USA by ILA, this ring wears well as a wedding band or an engagement ring for the bride who wants all the glitz and glamour without a raised setting. Check it out here! 6. Shine Bright Like A Diamond! This ring is definitely a statement piece! 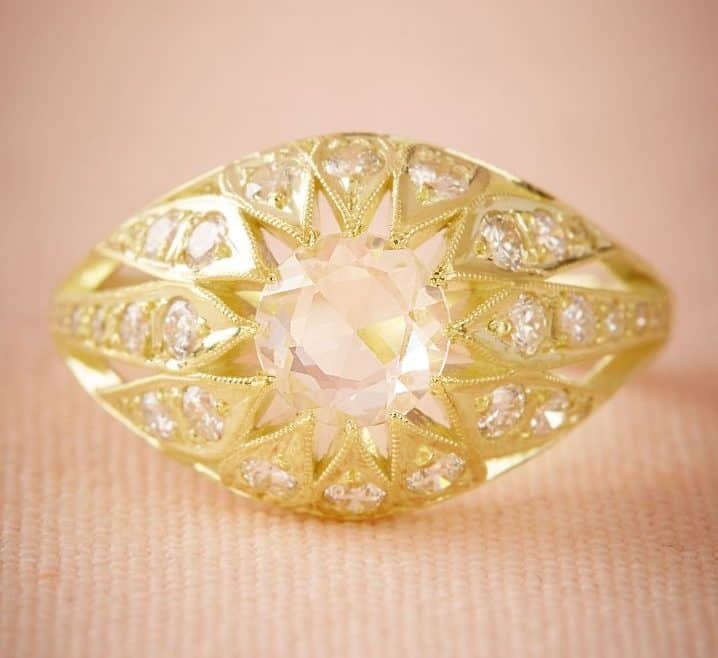 Crafted in 14k yellow gold and handmade in the USA, the Tamaya Ring features intricate detail, a gorgeous white sapphire at the center, and brilliant diamonds all around. The starburst design is so eye-catching and unique, it’s sure to turn heads, every time! Get this ring for the bride who loves bling, or the woman in your life who’s looking for a statement piece to dress up any outfit! Check it out here! Each ring featured is unique and obviously beautiful, but the most important part is that each one was created to suit the style of a free-spirited bohemian bride. As someone who always prided herself on being a nonconformist, I myself had trouble finding a ring that I just absolutely loved and had to have! So, I put together this list for you, in the hopes of making your ring-searching journey just a little easier. Did you enjoy this list? Let me know your thoughts in the comments and share the list with your friends!